The coming season marks a crucial period for squash, as it races to get its house in order and put on its best frock before next year's vote on Olympic inclusion. The worst kept secret in squash has finally been confirmed on the World Squash Federation website: Chief Executive Christian Leighton has left the organisation. "Christian has made a significant contribution since joining the Federation in January 2005, particularly in squash's bid to join the Olympic programme," added (Jahangir) Khan. "We wish him well in his future pursuits." What the re-structuring might entail when complete is not expanded on, though during the process of its implementation the administration the Federation will be overseen by its Management Committee, led by Khan and featuring Vice Presidents Heather Deayton (Hong Kong), Gerard DeCourcy (New Zealand) and Frank van Loon (Netherlands). As previously commented on this site and others, the departure of senior management during a crucial year for squash's Olympic hopes does not bode well. Sources tell me that a promo video is hastily being compiled in order to showcase the sport at its best; here's hoping that a professional media production company who are experienced in putting together such pitches have been commissioned. The WSF is due to meet IOC President Jacques Rogge on 13 November. In keeping with those optical illusions where the trick only works first time, when I now look at the logo I can't help but see only the racket and ball, which is a success of some kind. I've asked the WSF to clarify whether the website is a relaunch/rebrand/redevelopment but as yet have had no reply. As noted recently on Squash360.com, WISPA is leading the way in promoting the virtues of the sport and the professionalism of its players in support of the Olympic campaign. "When the Olympics began a few weeks ago all WISPA members were reminded that this was the time that they may be asked about why squash wasn’t included and whether we can get into them in the future. 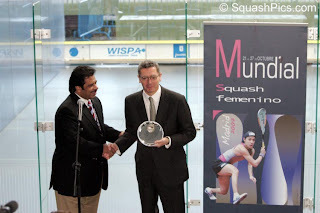 The notes are worth repeating now as the focus must remain strong as squash continues to press its claim for inclusion. We missed out on selection for the 2012 Games in London, but next year (October 2009) at the next IOC meeting which will be held in Copenhagen there will be decisions made about the venue selected for 2016 and the sports played. As a result of baseball & softball being voted out of London but not being replaced there are 26 sports to be played there, and thus places for two more in 2016 (the Olympic Charter stipulates a maximum of 28). So, we are in a fight with baseball and softball who want to get back in, along with the other shortlisted sports of karate, golf, rugby sevens & roller sports. - We are a truly worldwide sport, and compete in every other Major Games, including the Commonwealth, Pan American, Asian and All African Games. - Squash is different to all other sports in the Games, and rates as one of the most gruelling and skilled sports. - Our top players are serious professionals. - All our players are serious sports people. - We have become a really good spectator and TV sport because of the all-glass court. The glass court can be erected in any spectacular location and does not require an expensive stadium to be built, cutting costs for the host city/nation. - The top players in the world are a diverse group of people that come from many nations that are not the 'super powers' in the Olympics - creating opportunities for different nations to have a lead on winning medals. The Olympic bid is of paramount importance as we use the year in conjunction with WSF & PSA to promote ourselves in any way that we can. Creating a bigger profile and reaching out to key people and contacts is a main thrust of the strategy." Great point about the portability of the court as an asset: I don't think I've seen this in any squash-and-the-Olympics articles to date. While we're on the subject of changes and interventions being made by governing bodies, I read recently that England Squash is also undergoing a rebranding. "We are working with a branding agency, Fudge Studios, to create a new brand that represents the organisation as a forward thinking, modern organisation, but that also shows that squash and racketball are vibrant, exciting, relevant sports that are worthy of more interest, participation, and media coverage." Sounds promising - I look forward to seeing the result of the collaboration.